Nottingham Lakeside Arts | Dr Phil's Happy Birthday NHS? Dr Phil's Happy Birthday NHS? Nye Bevan's beautiful baby is 70 this year, but will she make a ton? A decade of austerity with a Brexit cherry on top has brought her to her knees. Dr Phil charts the course of the NHS from 1948 to as long as she lasts. Come cheer the heroes, boo the villains and look to the future of robot surgeons, Fitbit nurses and iPhone GPs. Batteries not included. Dr Phil Hammond has worked in the NHS for 31 years and loves it so much he still does. 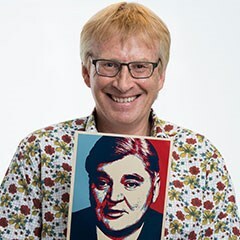 He is also a broadcaster, journalist, author, campaigner and comic.